We are so honoured to have been selected by Local Enterprise Office Wexford to represent our County in the National Enterprise Awards to be held on May 29th in the Mansion House, Dublin. Thank you to Tom Banville, Breege Cosgrave and the rest of the team at Wexford Local Enterprise Office for recognising the efforts that we make to sustain and grow our business. We appreciate the confidence they have shown in us. 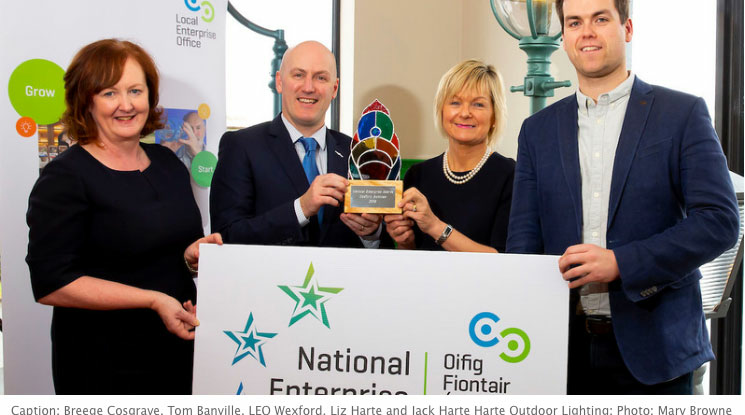 “The National Enterprise Awards are about recognising the contribution that small businesses make to the Irish economy and are open to businesses that employ ten or less staff and who have received support from their Local Enterprise Office (LEO). Businesses from all over Ireland compete for a range of prizes with an overall national winner also selected. In Wexford we have a diverse small business environment with plenty of talent and potential. However, we can only pick one small business to represent the county each year. Harte Outdoor Lighting is a family business and is Ireland’s only producer of high-quality cast iron outdoor lighting, post boxes and street bollards. Over the years, the Harte family has engaged with us at LEO Wexford to develop and grow the business. Their story is an example of how a traditional business can embrace the supports available from the LEO to innovate, expand their product line and upgrade facilities. Established back in 1983, Harte Outdoor Lighting now employs 10 local people at their workshop and showroom in New Ross, Co. Wexford. Their heritage style lamps are popular not only in the residential sector, but can also be seen in prominent places like Leinster House, Adare Manor, Ashford Castle and in public lighting in Kilkenny City and other towns. The company has ambitions to dominate the Irish market and to gain an unrivalled reputation as a manufacturer of distinctive, robust and quality cast iron products. Liz, Jack and Sam Harte have engaged with us at the LEO Wexford for training, grant aid to buy equipment and mentoring to grow the business. Jack Harte also took part in the Ireland’s Best Young Entrepreneur (IBYE) programme in 2016, going on to win the county finals. 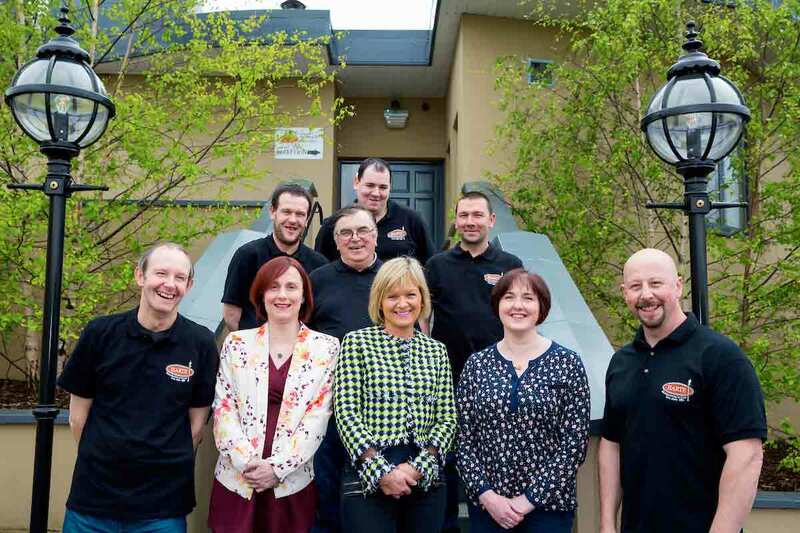 The Harte family are a great example of a small business ‘Making It Happen’ by looking for ways to innovate and enhance their business for their customers and the community in which they operate in. Not only have they expanded their product lines in recent years to include a more contemporary range of outdoor lighting, but they have also updated their showroom in New Ross and are an important employer in the local area. We are particularly impressed by Harte Outdoor Lighting’s commercial performance, which has been strong and steady with a track record of continuous profit. This business will develop a strong application to the National Enterprise Awards, with an emphasis on sustainability, quality and customer service. Judging will take place in April and May and Harte Outdoor Lighting will be competing against 30 other finalists from every local authority area for a share of the €40,000 prize fund. On behalf of the LEO Wexford, I’d like to wish the Harte family the best of luck as they prepare for this year’s competition. Thank you Tom, we will represent County Wexford to the very best of our ability. This entry was posted in News, Uncategorized and tagged Cast Iron Lights, Cast Iron Outdoor Lights, freestanding postbox, Garden Lights, Garden Lights Ireland, Irish Outdoor Lights, Irish postbox, Letterbox, Letterboxes, Outdoor Lighting, Outdoor Lights, Outdoor Lights Ireland, Postbox, Postboxes, wall mounted postbox. Bookmark the permalink.